The prospect of networking can be daunting—even for the most ambitious of us. How do you connect? What do you say? Why should they help you? These questions can overwhelm us to the point of inaction. But the prospect of networking doesn’t have to be so discouraging when you are only six introductions, or less, away from networking with even the president. Even as a small nonprofit with few staff, listing your collective contacts can amount to hundreds or thousands of people and is a strategic step for reaching those who may support your cause. As Skip Rutherford, Dean of the Clinton School puts it: Start with you who you know and build outwards. They used sticky notes to visualize the network. Staff members were at the core of the map. He asked each staff person to add a sticky note with the name of a “go to person” for this issue for their group and location. This became the next “ring” of sticky notes. They discussed any common contacts, and if the two staff shared the same contact were aware of it, and if they have a coordinated “relationship strategy” for that contact ala a triad approach. Look at your network, you may be only a few connections away from the president. But this connection is trivial not only because we don’t have a relationship but we’re also not in the same field. How you can use your few degrees of separation to work for your organization? Know your world. Who are the movers and shakers in your field or cause? Remember, you’ll have to build a pathway to them from the bottom up—from a local to a national or international scale. Understanding who these people are means being present. Go to networking events, dinners, workshops and bars to get to know who you should know. Then you can place yourself in direct contact with those people. 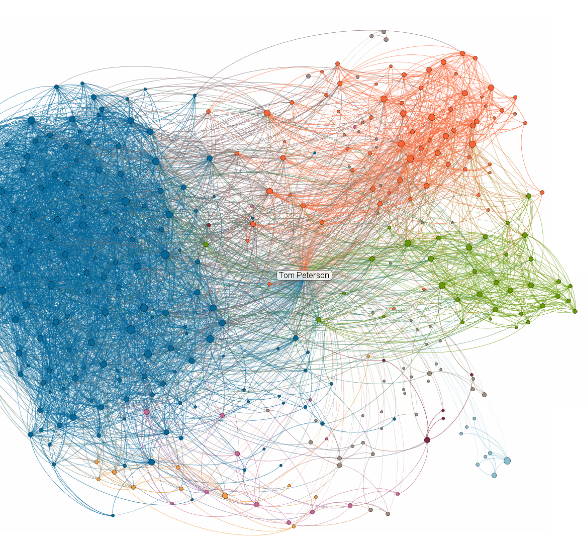 If you’re on LinkedIn, use this fascinating and powerful tool to visualize your network. Stay in touch. Like many things, a connection once made depreciates with time. Nurture your network beginning with a follow-up letter, call or email after first meeting your new contact. After visualizing your network, it’s good practice to prioritize your contacts and generate a schedule for contacting them on a routine basis. It’s not about you. Picture that angst-y teenager concerned only about him- or herself. Don’t let that be you! Be generous always. Find a way to reciprocate the favors made for you by your contacts, and your network grows stronger and more connected. This may be hard at first, but get creative. Connect contacts who have similar interests, forward articles related to your contacts’ interests or even let them know their favorite band is coming to town. This is critical to building a mutually benefiting and healthy relationship. Besides connecting with people in person, many websites and organizations are dedicated to connecting and streamlining nonprofit work around the world. Be sure to get involved with those that make sense for your organization. You can find links to 25 useful nonprofit networking sites. Wikihow has some nice networking tips, as well. Read Keith Ferrazzi’s book, Never Eat Alone, on networking and building relationships one a time. And here’s a bit of Ferrazzi’s thinking in a Fast Company column. Stephen Bailey works at Heifer International and is graduate of the Clinton School of Public Service. His interests include producing documentary films and developing creative campaigns that address social issues. The LinkedIn mapping program will show all your connections as dots linked by hundreds lines. Each is placed on the map and color-coded according to who else in your network they know. To learn more, go to LinkedIn’s map overview page, or to set your up go straight to the create my LinkedIn Map page. When you activate the map, you’ll see what your network looks like. You can drill down a bit: It’s one thing to note in LinkedIn that you have a couple of shared connections with Joe. It’s another thing to click on Joe’s dot and see who they are and what shared connections you have with them. And who else in your network he knows. You may also get insight into where you want to focus future networking. By the way, you should connect only with people you know, and preferably those with whom you plan to have some future dealings. 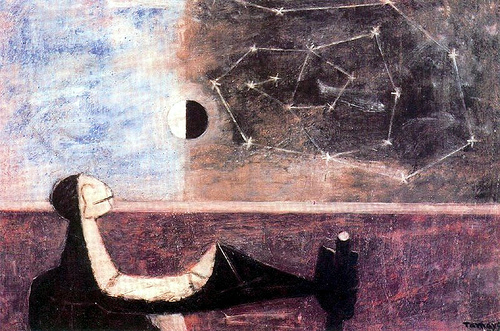 Painting by Rufino Tamayo, Man and the Infinite, Royal Museum of Fine Arts, Brussels, Belgium.